Abalones excel in small to moderate sized waves. This design emphasizes surface area to address these conditions and is significantly wider with dramatically fuller dimensions in the nose and tail. The design was developed in an effort to blend speed, performance, and glide in small to moderate sized waves. 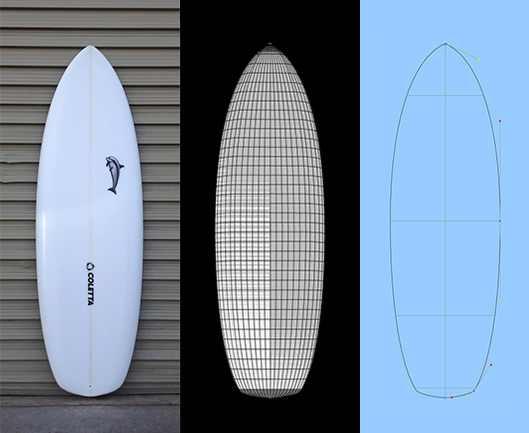 Surface area and volume are maximized to afford the surfer a very "user friendly" board. The length of the Abalone is extremely short - the width is extremely wide - the thickness is moderately thicker than most short boards. Low rocker profile, extremely full outline, flat deck with full rail profile, single to double concave bottom contours are integrated in the same manner as a high performance short board. The result is a barrel of fun and a fresh new approach to small and moderate waves.